Based on a wide variety of variable circumstances and environments a pipeline's physical condition will deteriorate over time and subsequent remedies must be applied in order to restore it to its original health. Since 1929 Denso Portal 7200 has been used to successfully reinstate the health of existing pipeline coatings in the field under varying conditions. High build, (up to 50 mils in one coat) fast cure epoxy coating with excellent adhesion that can be hand or spray applied to girth welds, tie-ins, fittings and rehabilitation of existing pipelines. 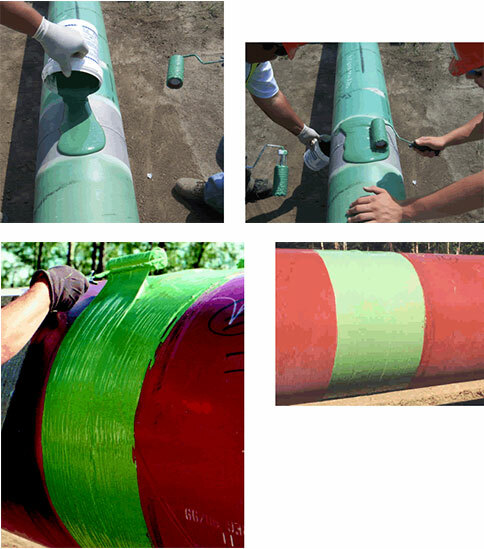 It compliments FBE coated pipe as well as being useful as main line or sacrificial coating for directional drill and road bore pipe. Protal 7200 exhibits excellent cathodic disbondment properties at 175°F (80°C) with 7 mm disbondment and does not shield cathodic protection. It is noteworthy for its ease of application, in that it contains no solvents and is unaffected by light rain 3 to 4 minutes after application, allowing almost immediate handling and backfill times. Protal has a long and proven track record for reliability and environmental safety. Fast Cure Epoxy Repair Coating is specially formulated for patching and repairing damaged FBE and other liquid coated pipelines. The formulation is also ideal for coating of cadweld and other confined areas. Our Denso Protal 7200 repair cartridges come in both 400 ml and 50 ml sizes and are packaged in 2-component tubes that are applied with a dispensing gun (sold separately).